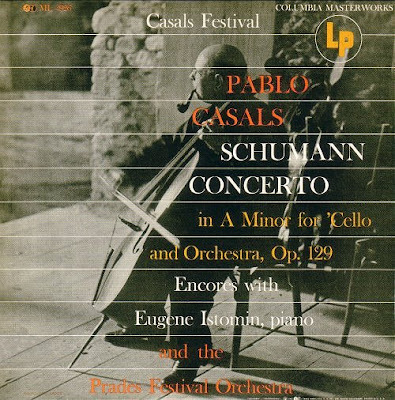 The traditional Catalan tune Sant Martí del Canigó [St. Martin of Canigou] was arranged for cello and orchestra by Pablo Casals who recorded the arrangement on the Columbia LP seen below in 1950. The header photo of the Abbey of St. Martin, Canigou was taken during our recent trip to Catalonia. Casals had fled to Prades in France in 1939 following Franco's victory in the Spanish Civil War. During our stay in Catalonia we were based in Argelès-sur-Mer which was the site of a notorious French internment camp that received more than 100,000 Spanish Republican refugees from the Civil War. Pablo Casals worked tirelessly to help the refugees and the camp at Argelès is movingly described in his memoir Joys and Sorrows, which also provides the quote above. This part of Languedoc is Cathar country and the genocide of the Cathars inspired a recent project from that other great Catalan musician Jordi Savall. His words from the notes for his Forgotten Kingdom album apply as much to the Spanish Civil War as they do to the Albigensian Crusade, "Absolute evil is always the evil inflicted by man on man". More images of Casals' Prades to follow. My 2008 article In Search of Pablo Casals opened with a tribute from the author of the book that provided the title of this post. * Sant Martí del Canigó is on one of the 10 CDs in Sony's Pablo Casals, the Original Jacket Collection. All but one of the CDs were recorded in Prades or Perpignan in French Catalonia. If you don't already have these recordings this is an 'must buy' at for price of little more than one full priced CD, even if the documentation is sadly inadequate for a historical reissue. ** Listen to the podcast of my musical homage to Catalonia here. It includes Pablo Casal's Sant Martí del Canigó and his motet Tota Pulchra, Cathar music from Jordi Savall's Forgotten Kingdom, arrangements for guitar and voice of traditional Catalan melodies by Ferran Savall, and more folk music in the form of one of John Jacob Niles settings of Thomas Merton's poetry. The Catalan connection of the Niles-Merton songs is that Thomas Merton was born in Prades in a house a short distance from the Villa Collette in which Pau Casals later lived for ten years. 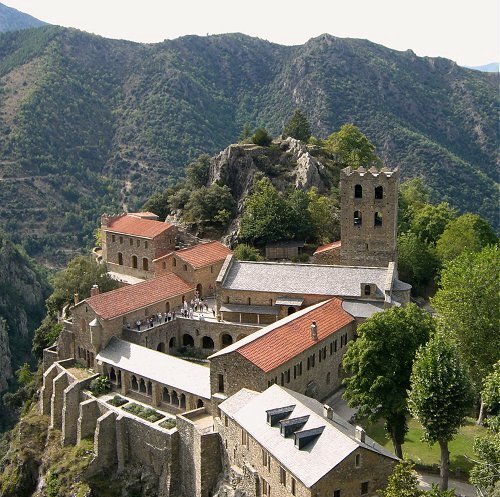 Merton mentions both the Abbey of St, Martin and the Abbey of Saint-Miche; de Cuxa, where the photo of Casals on the sleeve above was taken, in his autobiography The Seven Storey Mountain. More on the Villa Collette and Thomas Merton's Prades connection here soon. *** Header quote is from Joys and Sorrows, reflections by Pablo Casals edited by Albert E. Khan (Macdonld ISBN 356030482) - out of print but well worth buying at very low price from specialists. can't wait , pli ! Love Montserrat's Ell fill del rei. Billoo, it all becomes very converged at this point. Ell fill del rei is, of course, sung by Montserrat Figueras, aka Mrs Savall. 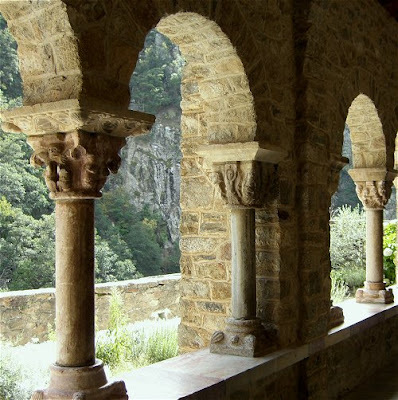 Montserrat is also the monastery in Catalonia which inspired Mr & Mrs Savall's 1978 EMI LP Llibre Vermeil de Montserrat, which is on my short list to provide music for the next programme. Pablo Casals' Tota Pulchra has been recorded by the choir of the Abbey at Montserrat (now deleted) and Casals also wrote a Salve Montserratina. Finally, moving on from Montserrat to Figueras, when we were in Catalonia we visited the Spanish town of Figueras. I will be posting about the Dali museum there soon.